Goodwood Park Hotel’s take on this year’s Chinese New Year staple is with the Fruits of Fortune Yu Sheng, offered at Min Jiang. It has fruits, flowers and vegetables in the centre while ingot-shaped osmanthus jelly and edible viola petals border the plate. Completing the dish with a crunch are pine nuts and shredded fish accompanied with Japanese plum and sesame sauce. This dish is available in two different sizes. The Fullerton Hotel pampers us with its Eight Happiness Gold Rush Yu Sheng, created by chef Leong Chee Yeng of Jade restaurant. The addition of home-made champagne jelly with edible gold leaves top the essential ingredient: good ol’ salmon. A honey pineapple dressing doubling up as a sign of prosperity (ong lai) gives the dish a sweet and sour taste. Choose from a small or large portion and toss away with your family and friends. Welcome a prosperous new year at The St. Regis Singapore with Yan Ting’s traditional Prosperity Yusheng with Norwegian Salmon. A symphony of fresh fruits such as pomelo, honeydew and snow pear is accompanied with marinated papaya, jellyfish and Norwegian salmon. Apart from the usual crispy crackers; fried egg noodles and crispy salmon skin are added to give the refreshing toss a crunch. The Prosperity Smoked Salmon Yusheng by Jiang-Nan Chun at Four Seasons Hotel comes with the classic smoked salmon slices served with preserved papaya, beetroot, shredded radish and pomelo. A homemade plum and pineapple sauce complements the dish together with crispy vermicelli and fried sweet potato strips for an extra crunchy texture to the dish. Add on goodies such as abalone, bird’s nest and Japanese surf clams to signify prosperity. Yusheng is available in two different sizes. Available at Sheraton Towers, Hamachi Loh Hei Platter comprises the quintessential ingredients of a yusheng. There’s the usual set of pomelo, yam, sweet potato, white radish, carrot and pickled ginger. Yet, there’s a twist. The platter includes Hamachi air-flown from Japan. Choose from a variety of other proteins such as Alaskan crab, lobster and salmon. All variety of yusheng, including the vegetarian platter, comes in two different sizes for both dine-in and takeaway. Yes, there’s nothing fishy here. The Pulled Pork Lohei served at The Carvery, Park Hotel Alexandra interprets the traditional yusheng with a modern twist by replacing the protein with what they are famous for instead of the usual fish slices. Apple strips and cabbage are added for a refreshing touch to the dish. Caramelised walnuts and tortilla crisp replace the usual golden crackers to give the dish an extra crunch. Binding flavours together is the sweetness of the white peach dressing and the tangy orange pearls. Staying true to the farm-to-table concept, The Summerhouse bends tradition by offering up an edible garden. The Farmers’ Yusheng is drizzled with sweet passion fruit hollandaise sauce over finely blended dehydrated nuts and mushrooms with fresh and pickled vegetables. Patrons dig into the dish with a quaint wooden spade for an added horticulture effect. The dish is completed with citrus-cured salmon and smoked sea bass. This truly unique yusheng is available in three different sizes. We’d definitely crown Antoinette’s The Queen’s Yusheng as the most aesthetically pleasing plate of yusheng in Singapore 2018 to toss — or crack. 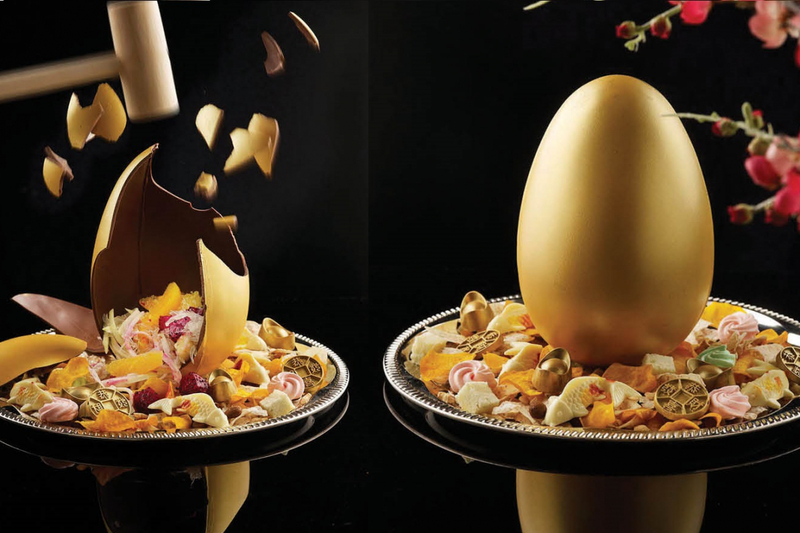 Presented with a golden chocolate egg, surrounding it are sweet treats like golden ingots, mandarin orange butter cake and meringue kisses with yam and sweet potato chips infused with traditional Chinese flavours. Drizzle mandarin orange, plum and gula melaka dressing over the egg or hit it open with a wooden hammer to signify an auspicious beginning.